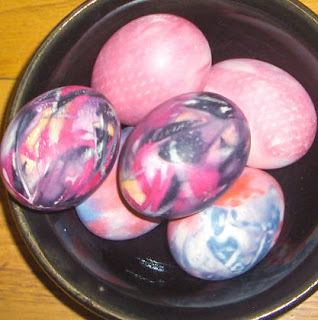 We tried making some silk eggs today, something I'd never heard about until just yesterday when I saw it online - check out these amazing examples at Our Best Bites. My selection of silk was limited since I didn't have time to go thrift shopping for a better selection; however, it certainly worked. Now I'll be checking the ties every time I go to a thrift store in preparation for next Easter. And sometimes my birthday happens to be the same day as Easter, and this year, so it is. Happy UnBirthday to everyone who didn't have a birthday on April 12th! (That's from Through the Looking Glass - an unbirthday, of course, can be celebrated on any day that is not your birthday.) And for those of you who are getting a reverse birthday gift from me (because I like to follow a few Hobbit customs too), I hope you have fun and find them useful. I would love your "reverse birthday gift." It just so happens today is my brother's birthday too. I love your handbound books. My email address is on my blog. The eggs turned out wonderful! A fun twist on an old tradition in our house. Hope you had a good day today on your birthday! I would love you have your instructions as well. You can never have too many explanations of bookbinding structures. I love the reverse birthday gift idea, I would love to have the documents to add to my files :) I think you have my email, let me know if you don't! I will love to have it. Happy Birthday I would love your reverse birthday gift. My email is fairiedust0807@yahoo.com. wow! happy birthday & easter! i'd love a chance at one of those book-making patterns! Happy birthday yesterday! I have been admiring your cardboard books, I think they would be great for artists' journals, tough enough to take all the paint,glue,fabric etc. I would love a copy of your instructions - my email is on my blog profile. Happy reverse birthday! Does that mean you are getting younger? Please send me a copy emjATuvicDOTca. Thanks everybody! I have just finished sending everyone a note - if you didn't get a message from me, please contact me again. Susie, I was unable to contact you as your blogger profile was unavailable to me... contact me by email if you still want to get the files. My email is in my profile. Isabel, Sometimes I wish I were a Hobbit! By now I think I can wish you a very happy unbirthday but I hope you had a wonderful day. I just happen to be able to get to my computer today - most days while I'm having renovations done I can't get near it for all the heaps of furniture. I've tried to follow your blog and a few others but as for blogging myself, it's just too hard. I'm missing it though. Thanks for helping keep me in touch with binding and book fun. Rhonda, I downloaded your reverse-gift - the instructions are terrific, thanks a great bunch again!